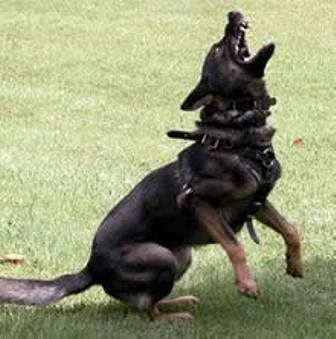 Personal Protection Dogs are highly skilled in dealing with modern day threats and protect using intensive training provided by reputable dog training facilities. Dogs trained to show controlled aggression will respond automatically when their handler is at immediate risk of attack, if their property is invaded or when the handler puts the dog on alert. They remain sociable at all other times. Once the aggressor is neutralised or the immediate threat removed, the dog will return to friendly status and if given the appropriate command will even allow the aggressor sociable contact. All dogs undergo an assessment for suitability – courageous and preferably even tempered. A sound mind and good physical abilities . Training usually lasts between 6 and 8 weeks. Personal Protection Dogs could be categorised as a weapon therefore it is very important that companies behave responsibly, taking all steps reasonably possible to ensure that such dogs do not go to the wrong people. ﻿*All levels (4) of Protection Dogs are trained in on/off lead obedience, aggression alert and if the threat continues, attack, release and return to handler on command. Protection Dogs make great family dogs, and are ideal for new and inexperienced handlers, whereas Elite Protection Dogs are the “Ultimate security.” They are selected only from dogs with working titles and from ring sports and retrained for protection work. I’ve never been one for exercise but I can feel a world record sprint (mainly in the opposite direction) coming on as I read this. Wolfie, When a dog barks at me, I immediately understand the message from the look in his eye and the manner of the Jaw. The Photo of the Alsatian exiting the door is a prime example. He means business. Humans are like that also. On these occasions the appropriate action is to retire to a safe distance, thus maintaining a neutral status between beast and I. Well, how nice to see you bloging again Wolfie, I picked this ufrom Rosemary’s page, right nw I’m watching Send in the Dogs,like a bit of bringing blog to life. 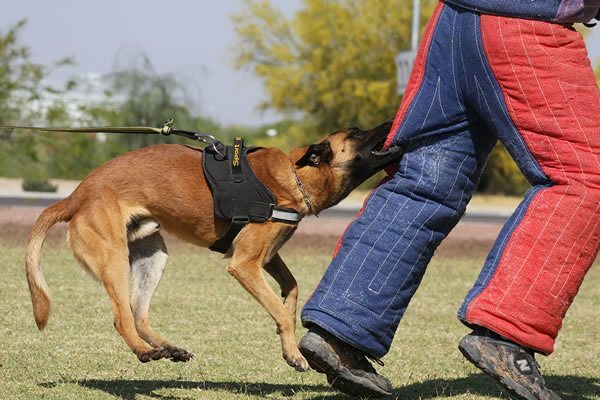 Very interesting blog and pictures to carry it through, Having owned and trained German Shepherds to a high standard for Competition Obedience I can appreciate the work that goes into the choosing and training of them, Am I right in thinking that the first dog and also is grabbing the trousers is a Malinois? As you say temperament is important, I saw this when I went to the Seiger show, you saw dogs really going in for a ‘kill’ the next they were lying on the benches with kids happily playing round them and allowing you to step over them, All credit to these trainers. Very interesting blog. Rosemary…it is the little dogs you should be wary of! Appearances can be dangerously deceptive! !Yes Arlene, it is a Malinois (Belgian Shepherd Dog) For the benefit of those who may be interested, the Malinois is a smaller, lighter, highly athletic breed and cousin to the GSD. They are extremely intelligent, alert and loyal dogs that work well in obedience trials and make excellent guard dogs and Shutzhund dogs. They also make excellent Guide dogs and work well as Assistance Dogs for the Disabled. Wolfie, like Jack Russell’s, but at least you can fight off a small dogl, a big one no chance. Hello Timid one. One end will wag, while the opposite end has it;s eye’s on your jugular….Yep some women are like that. I much love all animals………i respect working dogs too…….. ¡Eh!! Usted Y yo enviamos invita a!! Y han añadido automáticamente nos a los perfiles. Estás a salvo en mi perfil ahora;)) gran lobo de hielo abrazo y un beso!